Texas Hold’em is one of the most popular poker variations in the world and as such, is enjoyed by millions of recreational and professional players. This variation is also the foundation on which all other Hold’em poker games are based. At first glance, this poker variation appears to be rather simple and logical. And indeed, it is. But ask any experienced poker player out there and they will tell you Texas Hold’em is an easy game to learn, but mastering it may require what seems like a lifetime. If you are new to Texas Hold’em poker, we suggest you go through the following article where we explain the basic rules of the game, the hand ranking, the betting structure, and the table etiquette. Like other poker variations, Texas Hold’em utilizes a standard deck which contains a total of 52 cards. In most cases, the jokers are removed from the deck. As this is a high-ranking game, the ranks of the cards from the highest to the lowest are A, K, Q, J, 10, 9, 8, 7, 6, 5, 4, 3 and 2. Players should remember the Ace is counted as the highest possible card here. The suits are practically irrelevant as no one suit can prevail over another. Whenever two opponents hold hands that are identical in rank, but different in suits only, they split the pot. 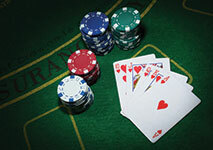 In Texas Hold’em, each participating player is dealt two private cards. These are dealt face-down and are often referred to as hole cards or pocket cards. Another key feature of this poker variation is that it is based on community cards, which means that five cards are dealt facing up in the middle of the table. These five community cards are referred to as the board and all participating players can use them in conjunction with one or two of their hole cards to improve their hand. The objective of the game is beyond simple – each player aims to collect the pot at the end of the betting round. There are two ways to achieve this. The first one is to form the highest-ranking hand at the table that would beat the hands of your opponents. However, if a given player has a weak starting hand which is impossible to improve with the cards that have shown on the board, the player still has a chance of winning if they successfully bluff their opponents. If other players are deceived into thinking that a specific player has a stronger hand, they might fold theirs and relinquish their claim of the pot. The number of players to join the game at once varies between two and ten. Beginners should first learn the ranking of the hands in Texas Hold’em so that they know which five-card combination beats which. Below, we have listed the ranking of hands from the highest to the lowest. The Royal Flush is an Ace-high Straight Flush and is the best possible hand one can get in Texas Hold’em. It consists of five cards that are all of the same suit and are ranked from Ace to Ten. The Straight Flush is five suited cards of consecutive ranks. This hand consists of four unsuited cards that are of the same rank and a fifth card (a kicker) of a different value. A Full House contains three cards of a matching rank and a pair of cards of a different, yet matching rank. The Flush consists of five cards that are of a matching suit but not necessarily ranked in numerical order. The Straight contains five unsuited cards of sequential ranks as is the case in the example above. This hand comprises three unsuited cards of a matching rank and two kickers of different ranks. As the name indicates, a Two Pair contains a pair of cards of a matching rank, another pair of a different, but matching rank, and a kicker. A Pair contains two cards of the same rank and three irrelevant kickers of different ranks as is the case above. This is the lowest possible hand in Texas Hold’em which contains card combinations that do not fall in any of the aforementioned categories. It is often referred to as “nothing” or “no pair”. The five cards are neither of sequential ranks, not are they of identical suits as is the case above. In many poker variations, including Texas Hold’em, the position of a dealer may give the specific player an advantage over their opponents. Please note that even though one of the players is referred to as the “dealer”, they often are not the one to physically deal the cards. Usually the cards are dealt and shuffled by a member of the casino’s personnel. 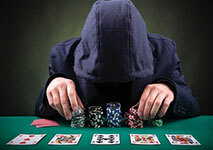 The player to act as a “dealer” is chosen at random prior to the game’s start. One of the players deals cards from the deck face-up and one at a time. The “dealer” is either the first player to get the Jack or the player, who has been dealt the highest card. A small, plastic disk, called the “dealer button”, is placed in front of the “dealer” to indicate the betting order in the game. After each hand, the dealer button rotates clockwise so that eventually all players get to act as “dealers”. Before the first betting round actually starts, the players are required to make initial, forced bets to create a pot. In some cases, this forced bet is the ante, which means absolutely all participants in the game need to contribute to the pot with initial, equal stakes. A game of Texas Hold’em may also begin with two of the players placing two forced bets, called the small blind and the big blind. The small blind is paid by the player occupying the seat to the left of the dealer button and is half the minimum stake at the table. The player to their left pays the big blind which is twice the size of the small blind, i.e. it equals the minimum table stake. Note that the small and big blinds are considered part of the two players’ bets, unlike the ante, which is more like an entry fee. Once the forced bets have been made, the players proceed with the first betting round. Texas Hold’em is a fixed-position game and players are not allowed to switch places at the table. The first betting round in a game of Texas Hold’em is often referred to as the Pre-Flop. Each of the participating players is dealt two hole cards. The first one to act is the player sitting immediately to the left of the big blind. The player can choose to call (match) the big blind’s amount, raise, or fold their hand altogether. The action proceeds clockwise with each player calling, folding or raising. If anyone raises the amount of the big blind, the remaining players can choose from calling this new bet, re-raising or folding their hands. Once everyone has acted, the Pre-Flop ends. The second betting round in Texas Hold’em is referred to as the Flop and involves three community cards being dealt and placed at the center of the table. The action again starts with the first player, who remains in hand and sits to the left of the dealer button. Players again evaluate the strength of their hands and proceed to bet, call, raise, or fold in a clockwise direction. Note that during the Flop and subsequent betting rounds, the players are provided with the option to check, or in other words decline to act, passing the action to the next player, who remains in hand. The third betting round is called the Turn and involves a fourth community card being dealt next to the Flop. Players can again choose to bet, call, check, raise or fold their hand. Once all players in hand have acted, the fifth and last community card, called the River, is dealt facing up next to the Turn. This marks the start of the fourth and final betting round with players choosing one of the five betting actions – calling, betting, checking, raising or folding. With the betting rounds over and all community cards at the table, the Showdown between the players remaining in hand can begin. Everyone, who has not folded on the last betting round, exposes their hole cards and makes their best hand possible. If necessary, the croupier may assist players in determining which the strongest hand is. The player holding the highest-ranking hand at the table is the one to claim the pot. If all but one player have folded, they would automatically be proclaimed winner and are not obliged to expose their hole cards for everyone to see. Also, if one player exposes a particularly strong hand, the others have the option to “muck” their hands i.e. to declare they are defeated and discard their hole cards without exposing them. The players who have previously folded are also allowed to decline revealing their hand. This way players can prevent their opponents from gaining valuable information regarding their style of play and strategies. The term “pot odds” refers to how much it costs players to remain in hand, compared to the overall size of the pot that has currently accumulated. This is a very important factor to consider. At the start of each of the four betting rounds, skilled players typically determine whether the amount of money it will cost them to remain in play for the round is worth the size of the pot they are competing for. The pot odds are often affected by the actions of fellow players. For instance, if everyone at the table has decided to check, it would practically cost you nothing to play since there will be no bets for you to call or raise. Then again, if there is plenty of raising in subsequent betting rounds, the cost to play may amount to three large bets. The next question that arises is how to calculate the pot odds. The good news is beginners do not necessarily have to be math geniuses in order to figure out what their pot odds are. Odds are typically expressed in ratios but many players prefer to convert them into percentages since the latter are simpler to work with. Let’s consider the following example. Eric and Ben are playing heads-up on the Flop. There are already $20 in the pot and Eric then decides to bet $5. As Eric’s money is now added to the pot, Ben is provided with an opportunity to bag $25 by calling Eric’s $5 bet. The pot odds, when expressed in the form of a ratio will be 25:5. The ratio’s right side is then made equal by dividing the second number by itself like this: 5/5 = 1. Of course, you need to do the same thing at the left side of the ratio like this: 25/5 = 5. From this, it follows that the pot odds in this case are 5:1. To convert this into a percentage, you need to add the two numbers together and then divide the cost of Ben’s call bet by the result, like this: 5 + 1 = 6, 1/6 = 0.16, which is equal to 16%. The term “equity” is used to refer to the specific amount of the current pot that belongs to a given player on the basis of the cards they hold. For instance, if you toss a coin (where chances are 50/50) to collect on a given hand and the current pot amounts to $500, your equity will be equal to $250, or 50% of the $500 pot. One important thing to remember is that equity changes from one hand to another. Let’s proceed with the previous example and assume your equity to win on the Pre-Flop was 50%, but your chances of winning on the Flop decrease to 25%. Other players have raised on the Flop causing the current pot to increase to $1,500. In this case, your equity for this hand would amount to 25% of $1,500 or $375. Why is this important? Common sense dictates that if a player’s equity in the current pot exceeds or stands at 50%, they are recommended to raise in order to boost the pot as their position to win is better. If player’s equity drops below 50%, they should avoid contributing more money to the pot. Learning the basic rules of poker, the betting structure, and the hand rankings is essential but it will not suffice to guarantee you a win. Mastering this particular game requires a good amount of patience, discipline, and hard work. Those who are new to the game often find themselves repeating the same mistakes again and again, without knowing exactly what they are doing wrong. If you are a novice, we suggest you take a look at the few tips we have listed below as they may help improve your gameplay. In Texas Hold’em, players are recommended to always consider their position at the table in regard to the dealer button. This is important because players in an early position, i.e. players seated closer to the blind, have no way of knowing how big the pot will get towards the end of this betting round or how many of their opponents would compete for the pot. It is generally recommended to play more hands when one is seating to the right of the dealer. Players must always evaluate the strength of their starting hand, which consists of the two hole cards they are dealt at the Pre-Flop. Holding a strong starting hand will prevent you from experiencing troubles after the Flop. Strong starting hands are those that do not need to hit the Flop as well as those, which improve players’ chances of winning after the Flop comes. Some examples of favorable starting hands in Texas Hold’em include A-A, suited A-K, suited A-Q, J-J, Q-Q, K-K, 10-10, and suited K-Q. Some beginners are unwilling to fold on poor hands but as a matter of fact, folding is one of the most frequently executed betting actions in Texas Hold’em, especially in tournament play. If you feel like your starting hand is weak and the chances of improving it on subsequent betting rounds are small, it would be best to fold it altogether. Another good idea when you are holding a high-ranking pair of hole cards is to try and eliminate your opponents before the Flop comes. To achieve this, you can raise before the Flop. If your opponents have weak hole cards, some of them might opt for folding, thus increasing your chances of winning this round. In this game, it is of crucial importance to study your opponents. Each player has their own mannerisms or “tells” which may indicate whether or not they are sitting on a good hand. These mannerisms may come in any shape or form as smiles, particular facial expressions or phrases, and twitches can all help you decide what your further course of action should be. When dealt a pair of hole cards on the Pre-Flop, you are recommended to play more aggressively if they are of a higher rank, and be less aggressive if they are of lower rank, like 5-5 or 4-4, for instance. Prior to joining a table at a brick-and-mortar cardroom, it would be a good idea to become better acquainted with the etiquette you are required to comply with. This would spare you the ostracism of more experienced players at the table. One of the most important things to remember is that you must always act in turn. If you bet or raise on a strong hand before your turn, this may lead to your opponents folding and thus, no one else will contribute to the pot. Remember that by acting out of turn, you are giving away valuable information about your hand to your fellow players. Besides, it is impolite, to say the least, so make sure you wait your turn. When folding, return your hole cards to the croupier without exposing them. When making a bet, do not throw your chips into the pot, because there will be no way for the croupier to tell whether or not you have bet the correct amount of money. You must simply put your stack of chips in front of you. Players must also keep their hole cards on the table while their hand remains in play. When you receive your two hole cards, you need to lift the corner of each to see what you have got while shielding the cards with your other hand. Once you have taken a peek at your hand, you should leave the cards on the table and place one of your chips on top. Players should also avoid discussing the hand they have folded before the betting round is over. Otherwise, they might provide their opponents with valuable information and improve their chances of collecting the current pot.